Here’s my square for the Tsunami Quilt project. 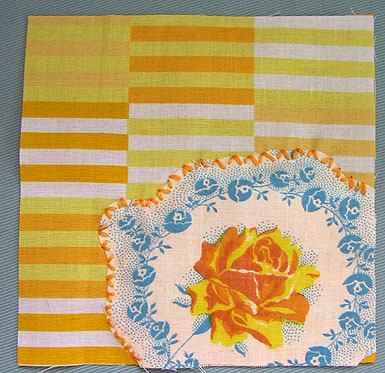 The yellow rose is from some feedsack fabric and the background is some Marimekko fabric I’ve been saving. I so struggled with this project. I really wanted to do something more elaborate and, I don’t know, symbolic, evocative, meaningful? But I’m crap at embellishment. So here it is. Bright and simple. At least this way the Marimekko isn’t all mucked up with my poor embroidery/embellishment skills! im with teresa, i like the simplicity of it too. very pretty. wow! that is gorgeous! beautiful work! Your work is truly gorgeous and so original. I love Oscar’s quilt. Just beautiful. I’m Trixie’s Grandma here in NC, Jenn told me to check out your lovely site and I’m so glad I did. I’ll visit again and look through more of your projects. I agree with all the other comments – your square is simple but beautiful! I LOVE it 🙂 Could you post this photo on the Flickr group page? And thanks everybody for the affirmation of my quilt contribution! I’m so happy to be able to contribute to such a neat project. And I’m very inspired by everyone else’s squares. Check out the link Rosa left to the flickr site. They’re amazing! That is divine. Scrumptious colours and Vintage Inspiration. Simple is always, always best. This square is so beautiful.